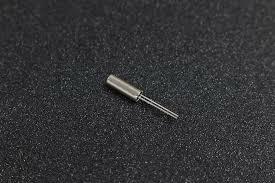 32.768 KHZ crystal oscillator is a standard Real time clock crystal. Standard ‘Watch’ or Real-Time-Clock crystal. 32.768 kHz means it is precisely half of a 16-bit counter. Start counting at 0x8000 (or 32768). When the counter rolls over from 65535 to 0, then you know that exactly one second has passed. Reset the interrupt, reset the counter, and start counting again! 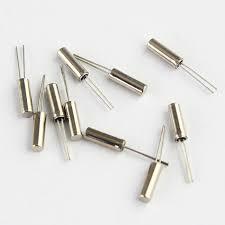 Rated at 12.5pF load capacitance, 35K ohm max (18K ohm typical) series resistance, and +/- 20ppm stability. Small cylinder package.